The Forest Hills Playground, currently closed for renovation, opened to neighborhood children almost 60 years ago. But the effort to create this play space began many years before that. Ann Kessler’s article below is adapted from two sources: A piece she wrote for us in November 2012 on the woman who advocated for our neighborhood’s children, and “The History of the Forest Hills Citizens Association: Service to the Neighborhood for 75 Years,” completed by Kessler in May 2004. Establishing a playground and providing recreational facilities for the children of Forest Hills was a constant concern of Mrs. Leslie Boudinot Flenner Wright, a neighborhood activist from the 1920s through the 1950s. As the mother of four children – three boys and one girl – she was instrumental in getting the city to set aside valuable land for a Forest Hills playground. 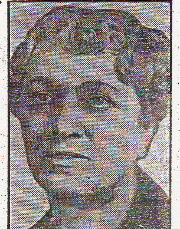 Already known as an effective activist from her experience in advocating for neighborhood schools, Mrs. Wright was appointed to the District Committee on Recreation by Commissioner Melvin Hazen in 1935. She supported the development of a recreation center in the Reno area, near the three neighborhood schools, but still wanted a playground for the Forest Hills neighborhood itself. In 1936, Mrs. Wright endorsed the Forest Hills Citizens Association suggestion that the plot of ground at Davenport Street and Linnean Avenue NW, just west of Grant Road, become a neighborhood park with tennis courts. This particular lot had historical significance as it was the site where Union soldiers had stopped and rested on their march out Grant Road during the Civil War. The dedication of this land for a playground was only a first step. The Citizens Association continued to appeal to the city, specifically Milo F. Christiansen, Superintendent of Recreation, for the construction of the playground. By 1955 when no playground had been installed and the land had not yet been cleared and graded, Mrs. Wright was appointed by the Association president as a committee of one to meet with Mr. Christiansen on the development of the playground. In 1956, no doubt through Mrs. Wright’s efforts, funding for the playground was appropriated and the grading and installation of equipment scheduled. In 1967, Citizens Association President Leon Brown requested in a letter to the DC Board of Recreation that the Forest Hills playground be named in honor of Mrs. Leslie Wright. A city official responded that designated names for playgrounds were selected at the time the NCPC condemned and acquired a property. Thus it was too late to honor Mrs. Wright. The city official suggested that the small recreation building to be included in the site under the Six Year Capital Outlay Budget of 1969 be named for Mrs. Wright. This building, of course, was never constructed. But thanks to Mrs. Leslie Wright’s hard work and determination, the children of Forest Hills not only had good neighborhood public schools to attend, but a safe playground in which to play. In 1968, there were new basketball standards, a jungle gym, fencing along the alley, and the planting of two cherry trees donated by the Forest Hills Citizens Association. The water fountain, which continually had leakage problems, was repaired and, in 1969, six portable toilets were installed at the playground. During this time the playground participated in the Recreation Department’s summer Sundial Program where adult and teenagers provided camp activities for young children. However, there was still need for a playground and park for the whole community. In 1975, the playground had a small grouping of metal playground equipment consisting of seven swings, one sandbox, three climbing structures; three or four picnic tables and benches; a baseball diamond; and basketball standards. That year the citizens association proposed new funding for the playground which would include an air conditioned field house, a softball diamond with bleachers, a basketball court, a handball court, a shuffleboard court and two tennis courts. A meeting to discuss the preliminary plan to improve the playground with representatives from the Recreation Department was held at Howard University Law Library on October 22, 1975. Over 150 interested residents were in attendance. Patricia Moskof and Judith Oldham led the Association’s effort for the building of a new playground. Patricia Moskof prepared a “Proposal and Justification for Development of the Forest Hills Playground and Park” for the Association to present to the Department of Recreation. With the help of Ward 3 Councilwoman Polly Shackleton, funding of $117,000 for a new playground was finally included in the 1978 DC Capital Improvement Budget with matching funds to be provided from the Department of the Interior. In 1977 the local Advisory Neighborhood Commission recommended that M. Paul Freedberg and Partners be chosen as the designers for the playground. The new plan called for a tot lot, baseball field, seating and recreation area for seniors, and two tennis courts. It was hoped construction could start in 1979. In 1981 the playground was in its final stages of improvement. Finally on July 4, 1982, the official dedication of the playground was held. It was an all-afternoon family picnic with receipts from the food and white elephant tables going for additional landscaping for the park. A tennis tournament was held and, as part of the playground dedication ceremony, Mayor Marion Barry planted ivy. The Association and the ANC together paid for the base of a donated sculpture, Le Rideau de Fer (the Iron Curtain) by Vincent Bathbedat. The playground equipment, however, was felt to be inadequate. Thus, on July 4, 1990, there was a groundbreaking for a new, improved, Forest Hills playground. The Northwest Current called the building of a new Forest Hills playground a “Miracle on 32nd Street.” Marlene Berlin and her Forest Hills Citizens Association’s Playground Committee raised over $41,000 from neighborhood residents, businesses and others – e.g., the Marjorie Merriweather Post Foundation donated $5,000 for landscaping. With the help of volunteers working four shifts, the new playground equipment was installed in October, with the formal dedication taking place Veterans’ Day 1990. The neighborhood children now had a new, large climbing structure in their modern playground. By 1999, however, the Department of Recreation declared the playground equipment unsafe under the new Consumer Product Safety Commission standards and removed it without warning that December. The neighborhood parents and residents were dismayed to find the playground equipment gone and dissatisfied to hear what the city planned to put in its place. Again concerned parents organized. This time they created the Friends of the Forest Hills Playground which raised funds and worked with the city in planning and creating the new 2000 Forest Hills playground. Forest Hills Connection is produced by volunteers, and supported by you. We appreciate your support – financial and otherwise. Here’s how to donate. Be it an iPhone, PC or a digital photos collection run amok, the Computer Tutor can help you master your tech. Your yard needs it? Landscapes Plus can do it. Mulching, landscape design, tree installation and more. Highly recommended: Nanny seeking work caring for infants or driving older children. Small, nurturing Montessori preschool across from Murch accepting Fall 2019/Spring 2020 applications. Small class sizes, thoughtful instruction at The Children’s Art Studio’s full-day summer art camp. See your text ad here, with a link to one of FHC’s most-visited pages – the Classifieds. Email us for details. Shirley Rivens Smith on Backyard Nature: Where is all that pollen coming from? And why is there so much?